The euro recovered last week, more on the receding dollar than on the strength of the euro zone economy. 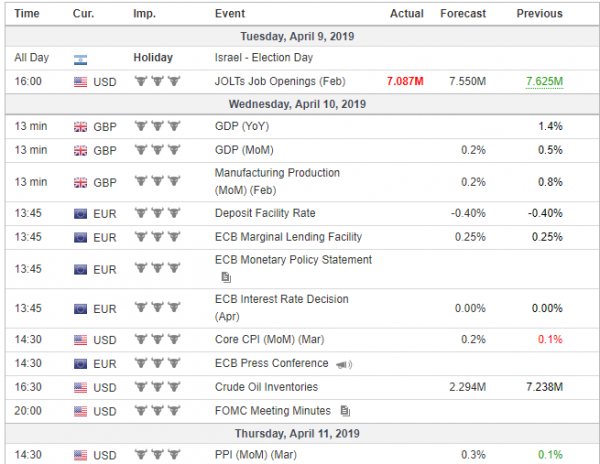 The ECB monetary policy meeting will be held on Wednesday and interest rates are widely expected to remain at zero percent. The British pound was little changed over the week, but continued to be highly volatile. Prime Minister Theresa May asked EU leaders to postpone the Brexit date until June 30, in anticipation of an agreement with the opposition leader Jeremy Corbyn, which would be supported in the UK Parliament. The Japanese yen was mainly flat against the dollar over a broadly uneventful week in economic terms for the country. The Turkish Lira traded lower over the past week and hit a two week low, as disputed local election results sparked fears that President Erdogan will tighten his grip over economic decision making in the country. Gold prices rose strongly on Monday and Tuesday as the rising dollar eased and a risk of a disorderly Brexit and a new trade dispute between the U.S. and the EU intensified. U.S. indexes rose last week as investor outlook remained broadly positive. Trade talks between the US and China are expected to conclude over the next four weeks. But on Monday sentiment soured, as a dispute between the U.S and the EU emerged. The U.S. listed 11 billion dollars worth of EU products it plans to hit with tariffs, while the EU begun preparations to retaliate over aircraft subsidies. Oil prices rose significantly last week hitting a 5-month high. Strong NFP data on Friday and concerns on Libyan supply disruptions supported prices. Saudi Energy Minister Khalid al-Falih indicated that a decision on the extension of supply cuts in the second half of 2019 might be taken at a lower-level OPEC meeting of joint ministers in May.